Use TB30DN9 to reference this item. Attached to this token is a picture of Tod, one third of Team Rod & Tod w/Kaboom. Tod was tragically killed when a vehicle turned in front of his motorcycle. He was not wearing a DOT approved helmet. Do you know someone who has been injured or lost in a motorcycle or bicycle accident? Please feel free to attach a laminated photo of them to this token! Be sure to let me know their name so I can add it to the list below! 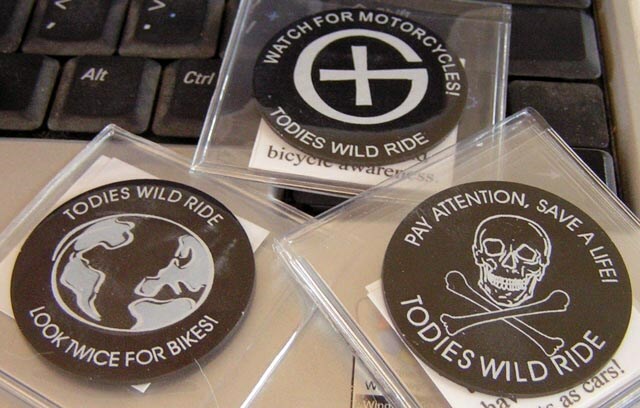 The mission of this token is to travel around the world spreading the word: PAY ATTENTION, BIKES ARE EVERYWHERE! NOT in Kingstowne Cache. The log was the only thing in the log, when I found it, today. Apparently the cache went missing after this was dropped off. Discovered this one after wishing happy birthday to AF. Discovered in a very nicely done cache.